Mike Heinrich and his amazing team at Reframe Health produced the storyboards and audio effects. This project was supported by the Robert Wood Johnson Foundation Global Ideas Fund at CAF America. Big thanks to Erin Moore, Wendy Sue Swanson, MD, MBE, and Mike Evans, MD, for their contributions. Please watch the video, read the transcript, and let me know what you think! Hi Susannah, I loved this video. It’s exactly what I speak about when I am occasionally asked to talk about social media in the UK. I also looked into peer support for my dissertation. When I talk about it I explain that HCPs under stand the ‘know what’ (what is diabetes? What treatment do I need to have? What might happen?) but that peers understand the ‘know how’. That is how to act it out in reality, how to manage day to day with the non-text book version of diabetes (in my case). Knowing ‘how’ is about lived experience and that’s what we need to share. Tap into the experience and knowledge of everyone. Thanks, Anne! I hope that the video is useful as an introduction to the concept — it’s people like you who can amplify and build on it. There are so many ways we can contribute, by building tools to help people get started, to deepen engagement, to capture people’s stories and data… My goal was to help build awareness that these tools and resources exist at all. What’s the proposed audience for the video? It’s very nicely done, of course, but left me wondering about the targeted audience. Great question! The target audience is the general public — or probably more accurately the health-interested or -adjacent general public. I partnered with Mike Evans, Mike Heinrich, and their team at Reframe Health Lab in order to learn from them about how to communicate thoughtful, educational material to a general audience in a fun and engaging way. We worked on the script together, editing it down to just a few studies, and one great story (Erin Moore’s), then added Wendy Sue Swanson’s testimony for another boost of credibility (because let’s face it: lots of people still want to hear that this peer health advice stuff is OK by health professionals, too). As I wrote in my comment to Anne above, I hope that the video can be an introduction to a wide audience and then others can follow up with resources. In fact, I’d love it if the comments on YouTube became a list of resources — tools, blogs, communities, etc — that people recommend for further exploration. 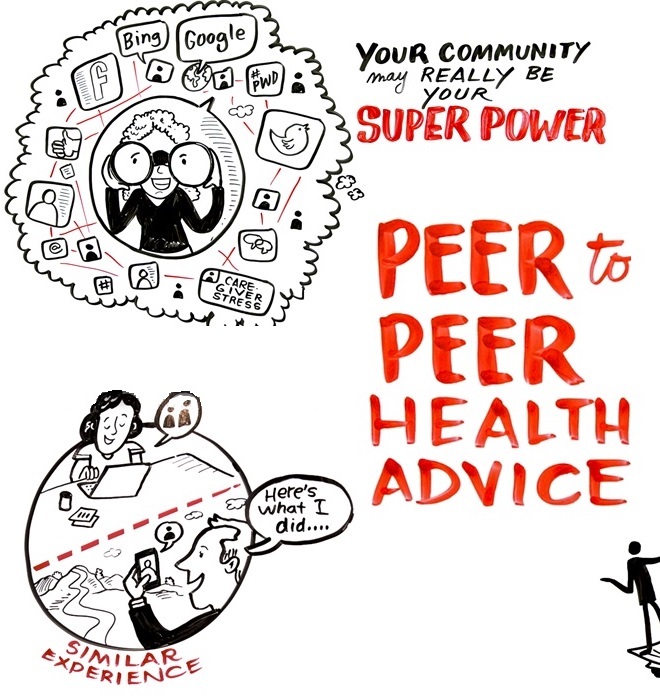 Will you help me gather & share examples of #PeerHealthAdvice? Tweet your own experience or RT others’ with the hashtag. Thank you! I’m open to people’s ideas about how to lift up these stories in a more organized way. I can blog about them and then link to that post from the YouTube comments. Or encourage people to post to the YouTube comments themselves. Just two ideas I had — please let me know if you have others! Great video, Susannah! Peer to peer collaboration is an extremely valuable tool that is mostly ignored in health care. If utilized appropriately, the greatest untapped resource for improving societal health is the knowledge, wisdom, & energy of individuals, families, and communities who face challenging health issues in their everyday lives (Doherty & Mendenhall). By applying this P2P approach, ordinary citizens become assets in health care, co-producers of health for themselves and their communities. This concept is one of the core foundations we’re building on at Citizen Health. I’d love to team up and help you spread this model on a national scale. I truly believe it is one of the cures for our strained health care system. Yes, and I’m bereft! If you (or anyone reading this) has an idea about how to save my Storify stories, please let me know. Update: I saved nearly all of them on Wakelet. Here’s my collection of studies and stories related to Peer to Peer Health Advice. iConquerMS – what’s your SuperPower? A patient powered research network supported by an online community sharing experiences is my ultimate dream – and then converting it all into a learning health system to improve care for everyone in a timely fashion rather than wait years for research to be published. I love this video and am sharing it wide and far now that the holidays are over and we can get back to business! Thanks, Laura! And I love that tag line. Please let me know if you hear interesting reactions to the video – positive OR negative. Eager to learn from people about what resonates, what questions they have. An oncologist I started following on IG a few days ago posted a photo of one of your NIH presentation slides from today…. I asked him for the author’s name and then googled you. As a healthcare professional, I had no clue of the power and value of P2P networks until a fellow MBC pt told me about closed FB groups. The support, education and collaborative learning is astounding! They are my people for learning to “live with”. Unfortunately, people report that when they attempt to post a flier at their cancer centre about a FB group they benefit from, it gets removed. Patient support groups are automatically suspect. I get it… professionals can’t recommend what they can’t access and assess. But still we need channels to help clinicians normalize conversations with patients about online support and to help patients navigate this space. Patient learning and support is not linear and unidirectional, solely from professionals to patients. Some things, I can only learn from other patients. Loved this video clip. Thank you! Eileen, this made my week! Thank you so much for finding my blog and sharing your story. The event is being video cast and the complete video of both days will be available in two weeks. Again, thank you! The more we share, the more we learn — and that goes for every stakeholder in our health care system. I submitted an abstract for a palliative care conference about patient to patient online support, education and learning. If it get’s accepted, I would love to show them your video. (if you are willing to grant me permission) We need to inform healthcare professionals and patients/family caregivers alike. Peer support is so powerful. I am a registered psychotherapist and certified spiritual care practitioner (hospital chaplain). I am witnessing profound palliative care support and education provided by patients to fellow patients. (I’m living with metastatic breast cancer) My FB groups are my go to places when I am in distress, have a question, need hope, or a safe place with people who “get it”. Yes! We created the video with the hope that people would use it in just this way. Please let me know how it goes! Thank you! We will see if the abstract gets accepted. I did share your video on the FB pages I created (Thrive Anyway – Resilience and Health, and Living with Bone Mets) and also on some of the FB groups that I have benefited from. Newly dx with bone mets, and a mom of a young child, I was looking for information on how to exercise and move safely. I went to the website of my cancer society, and the only information about safe movement was basically to wear good slippers, use a cane or walker and keep the hallways in my house clear. Good tips, but not at all appropriate for people like me. I contacted them and offered to help expand this section. A polite phone from them declined my offer, but they asked if they could keep my contact information on file. I consented. They put me on their fundraising email list. I unsubscribed. Ugh. Eileen, how might we fix the disconnect – extremely outdated – between the reality of patient groups and the belief that nothing is to be considered useful if authorities haven’t approved it yet? What pathway might lead us to an updated belief? It’s so ironic that in the current situation the “trustable authority” is wrong! Dave deBronkart, I think the challenge is, and always has been, sifting through the “miracle cures” that circulate and quality information. However, one does not have to be online to be bombarded with all sorts of “treatment” options. Healthcare professionals addressing this aspect of navigating illness upfront is helpful. It would also be helpful if their assessments also included questions about sources of information and support – both face to face, and online. Some online support groups are drama filled spaces and others are incredibly supportive and include the sharing of research and journal articles. Finding the right resource “fit” for where a patient is in their disease trajectory, and helping people “dose” online engagement so it is not overwhelming are important conversations to have. Personally I think that patients have an incredible body of knowledge through lived experience and we have a lot to offer in terms of collaborative learning with professionals. Writing, sharing our learnings with our healthcare teams, engaging in advocacy, submitting abstracts for conferences…. any of this appeal to you? I am the Connections Manager at the National MS Society. Your video on peer to peer health advice completely made my day. This is why I do what I do. Let me know how else I can get involved or how we can partner. I don’t have an “ask” or formal idea about how we might work together, but I’m thrilled to know that our video is useful to you. And if I can be helpful to your cause, please let me know (email is SusannahRFox at gmail). Again, thanks so much for letting me know that you like the video!